You are here: Home / Travel / UberX Vs UberBlack: Is the Lower Cost Worth the Ride? UberX Vs UberBlack: Is the Lower Cost Worth the Ride? So here's the deal: Grab acquired Uber Thailand and a number of other Southeast Asian countries. Uber owns 30% of grab, but all ride hailing requests now need to be done through the Grab app. The good news is that Uber is still operating in over 80 countries, including countries across Asia are like Taiwan, Hong Kong, and India. And of course you can hail an Uber in Australia, New Zealand, USA, UK, pretty much all over the world. So the reality is you are still going to need the Uber app on your phone, for when you travel outside of Thailand, Singapore, etc. The good news is that you can still get a FREE RIDE by using my promo code. And if you still want to read the review below on the old UberX service, which is kinda similar to a lot of Grab cars anyway, you can do that below. I also have a review on the main service that offers luxury sedans on this page. Damn it! No luxury sedans available. It does happen from time to time during busy periods – like the school run and Saturday/Sunday afternoon shopping. 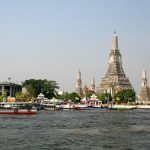 It's Sunday and I want to take my daughter to Central World, and I don't want to risk taking a public taxi. 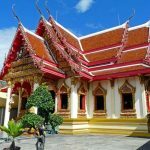 Luckily, Uber have launched UberX in Bangkok and, since I first penned this post, there is Uber in Chiang Mai and Phuket. So what the heck, let's Uberx it! I'll be honest here: I've gotten so used to being picked up in spanking new Camrys, Accords, Mercedes, and BMWs with UberBlack, that I have been reluctant to step down to the cheaper service. In fact, I can't remember the last time I got in a public taxi – what a snob, eh? Uberx can be found under a tab in the bottom-left-hand-side of your app. Basically, you get whatever car is available, but not the slick, brand new sedans you get with the Uber Black service. This is why it's half the price of the premium service, and not much more than a public taxi. The big difference between this and a public taxi though, is the added luxury of being picked up on your doorstep by someone who actually has a driving licence, and seat belts! What Cars Do You Get With UberX? I was a little apprehensive, imagining a clapped out old banger pulling up outside. But when my driver popped up on the screen and I read the words “Toyota Commuter”, I was perplexed. I thought that was a model of mini van? The sprog, wife and I were picked up in a 9-seater. For the same price as a standard taxi (there was a promotion on). My first thought was, this guy won't even cover his petrol at that price! My second thought was, this is way better than expected! The Commuter wasn't brand new; probably around 4-5 years old. But it was clean, comfortable and well driven by a friendly driver. And so I put my feet up, began penning this post and enjoyed the ride. That wasn't a regular ride though. The usual cars on UberX are smaller than UberBlack. Usually you get the smaller Honda and Toyota models, and not usually as new as the UberBlack cars. That said, I've had new Civics, Almeras, Suzuki Swifts, Accords and all sorts. It can be a bit of a lottery but the drivers are 9 times out of 10 very good. If you have a lot of bags, a buggy maybe, or a couple of kids in tow, it might be worth going for UberBlack to ensure you have boot space and space in the back. How Does UberX Pricing Stack Up Against UberBlack? I took a luxury sedan (Uber Black) back from Central World, and here's how the pricing compared with the UberX I took to get there. 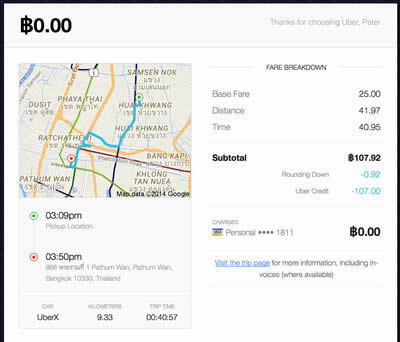 As you can see, the difference is approximately 72 Baht when using the UberX service, and I traveled a couple more kilometers on the outbound journey too. Not got an Uber account? When Uber Black is giving you the annoying “No Cars Available” message. 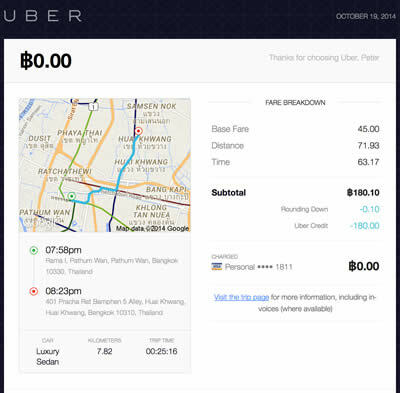 For trips to and from the airport – UberX is 5oo Baht cheaper than the Uber Black standard fare of 1ooo Baht. For those on a budget who want an ultra-convenient, better than a normal taxi service for pennies on the dollar. I don't tip usually tip in Uber Black; in fact, Uber tell you that there is no tipping culture within the company, but I did give my Uberx driver a 50 Baht tip this time. I guess I felt a little bad that such an excellent service, and a pretty long ride, cost me just over 2 pounds! If you haven't already signed up for an Uber account, you need to do that by clicking here. Make sure you enter the promo code TTLUBER2018 to get 150 Baht FREE credit. To order a car, select UberX or Uber Black from inside your app. 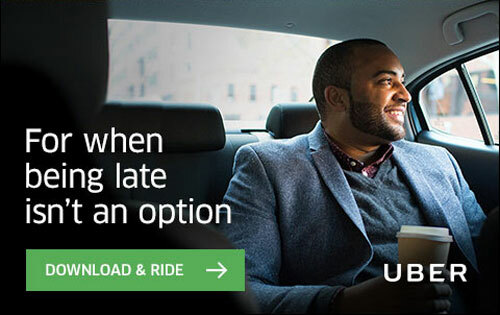 Leave your UberX experience below in the comments section. I'd love to know what kind of cars you get picked up in and what your thoughts on this service vs. the black service. Typing this from the back i of my UberX ride- Mega Bangna to Silom Complex. Very impressed with my ride there and this one as well. Newer car Honda CRV (both ways). Excellent driver. I live in Manila and rarely take my car out due to traffic and parking hassles Uber is fantastic!